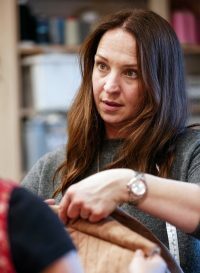 Ali joined BOVTS in 2017 on a permanent basis, having been a visiting tutor for 10 years and a freelance costume maker for the last 23 years. 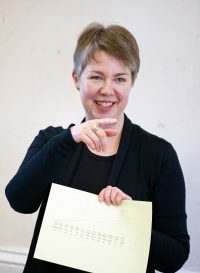 She holds a BA in Fashion (Middlesex University) and graduated from the BOVTS Cosutme course in 1999. Ali has spent many years working across Theatre, TV, Film and in the Fashion Industry. Production credits include: Young Vic Theatre, ENO, BBC, Endermol, and Coast – ranging from Opera & Fashion to Light Entertainment. Ali teaches costume making to undergraduates on the FDA and BA (Hons) programme. Current modules include: pattern drafting and cutting, garment development and construction, sewing and corsetry techniques, and design interpretation. The Costume department works alongside the Acting, Design and Production Arts departments to produce costumes for the many productions. Ali provides technical support to the students in realisation of a particular garment and finish.